← U.S. infrastructure overall gets a D+. What grade would you give U.S. weather infrastructure? Drone technology has understandably raised safety and privacy concerns. Regulators are working feverishly to determine where and how pilotless aircraft can be operated. Privacy issues related to law enforcement remain largely unresolved. Technical issues include how to secure the RF data links between pilotless aircraft and operators on the ground. Despite growing angst over the technology and debates about the use of armed drones to assassinate terrorists, UAVs (the less threatening designation, standing for unmanned aerial vehicles) are poised to play a larger and revolutionary role in weather forecasting and climate modeling. Indeed, the U.S. military’s Global Hawk UAVs have literally been converted from swords to plow shares. 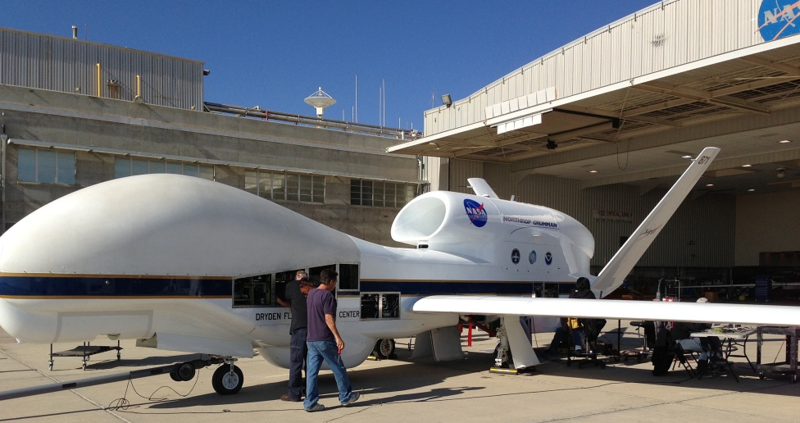 NASA’s pilotless aircraft began flying in and around hurricanes last fall. Under a new program called Hurricane and Severe Storm Sentinel (HS3), an instrument-packed Global Hawk studied Hurricane Leslie to gather data on the processes underlying tropical storm and hurricane formation as well as changes in storm intensity. NASA plans to continue the flights from Wallops Island, Va., during the 2013 and 2014 hurricane seasons, building up a database of storm data and scenarios about how major storms form over the oceans and evolve as they reach our coasts. Many are familiar with Global Hawk’s military surveillance role. The science version of the Global Hawk is capable of remaining aloft for up to 28 hours, has a range of 14,000 miles and can fly over storms in the lower stratosphere at altitudes greater than 60,000 feet. Ground controllers at NASA facilities at Wallops Island and the Dryden (soon-to-be-renamed Neil Armstrong) Flight Research Center at Edwards Air Force Base, Calif., oversee the flights. UAVs could eventually replace dangerous hurricane hunting missions now flown by converted Navy P-3 aircraft that require a crew of 10. Gulfstream aircraft capable of reaching about 45,000 feet are currently used to fly over the top of storms. Unmanned Global Hawks can fly above the “soup,” keeping crews out of harm’s way while providing better weather observations that improve modeling. In the long run, proponents say UAVs operating with ocean sensors could provide a low-cost adjunct to costly weather and Earth observation satellites, some of which could be delayed by federal budget cuts. “If combined with land stations and on the same extended grid, it would allow a global, spatially unbiased network for climate monitoring and weather prediction,” Alexander “Sandy” MacDonald, director of NOAA’s Earth System Research Laboratory, argued in a paper published in the Bulletin of the American Meteorological Society in December 2005. (See http://irina.eas.gatech.edu/EAS_spring2006/MacDonald2005.pdf). I circled back to MacDonald the other day for an update on how UAV technology is being used for climate monitoring and weather prediction. He emphasized NOAA’s pivotal role in getting the HS3 program off the ground with funds to help purchase Global Hawks, ground stations and scientific instruments. An operational network based on UAV’s, moored buoys and even unmanned boats measuring surface pressure during storms would expand coverage to the 70 percent of the globe where vertically detailed observations are scarce. The result would be a global profiling network needed to develop credible long-term climate models. With surface temperatures still high in the Atlantic Ocean, some observers think more long-track hurricanes could be coming in 2013. We’ll continue to track how the hurricane trackers are using new tools like UAVs to stay ahead of the next big storms while gaining a better understanding of regional climate change. From the NASA release: “The advantage this year over 2012 is that the second aircraft will measure eyewall and rainband winds and precipitation, something we didn’t get to do last year,” said Scott Braun, HS3 mission principal investigator and research meteorologist at NASA’s Goddard Space Flight Center in Greenbelt, Md. Hurricane hunters will no doubt be busy.